Wearing a wedding dress is a chance to wear something truly unique and stunning. 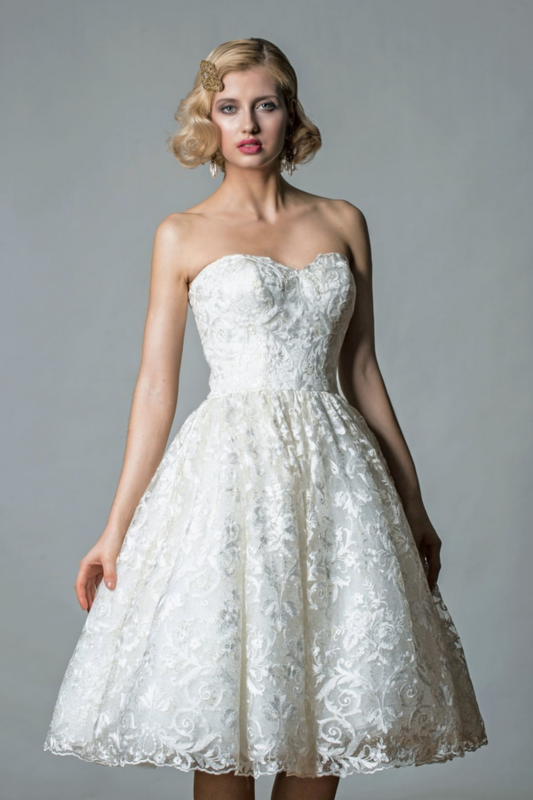 Choosing a short wedding dress that suits your style and wedding is a must. It’s a dress you might want to wear time and again. 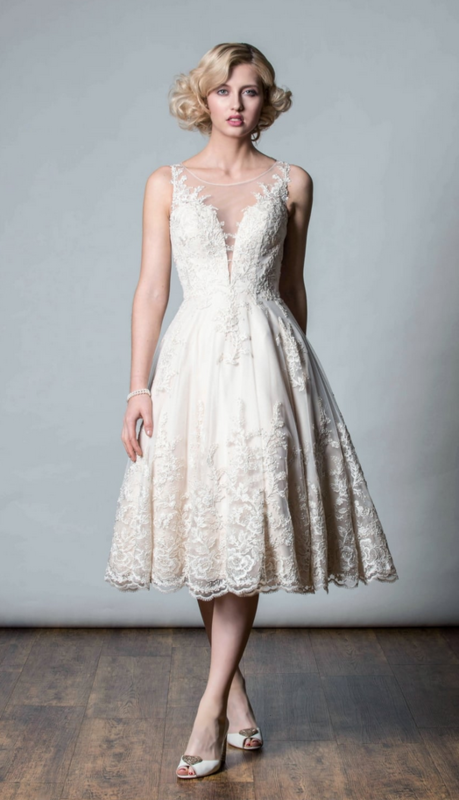 This is why Rita Mae short wedding dresses are amazing. This stunning collection of short wedding dresses came about after the demand for alternatives to traditional wedding gowns. With a definite edge towards wedding gowns that can be worn on your wedding day and afterwards. Marguerite Hannah creates timeless short wedding dresses that are versatile and beautiful. From beach wedding to a registry office wedding and anything in between Rita Mae short wedding dresses fit in. Each dress is designed in three lengths; short, tea length and long so there really is something for every bride to be. The show stopping Arizona, which is a beautiful polka dot tea length wedding dress. It has an off the shoulder neckline which dips into a subtle v neck at the back. 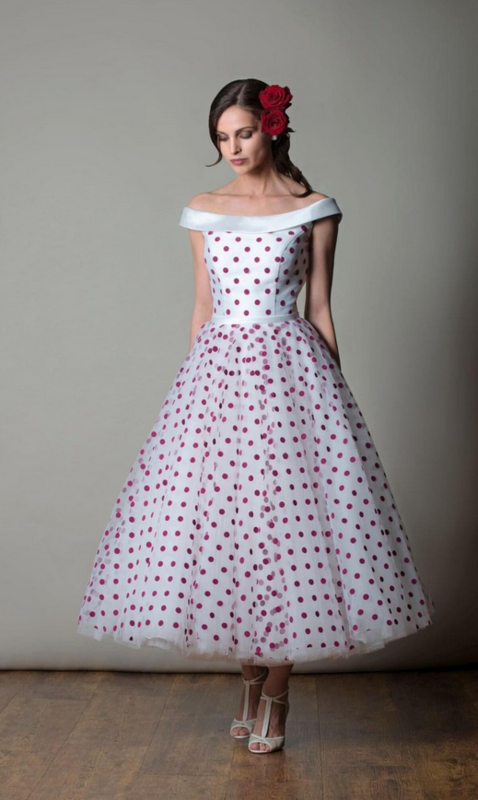 This is a truly classic and timeless polka dot wedding dress. Emily is a strapless gold embroidered lace vintage inspired short wedding dress. As the dress moves, the gold embroidery catches the light and sparkles. The delicate bodice enhances the shoulders and neckline. This short wedding dress will take you from day to night. Anastasia is a strikingly unique statement wedding dress. The champagne gold lace beading flows all over the dress and the stunning deep v bodice has an illusion neckline with lace edging that softens the overall look. This is a wedding dress to party in. Amalfi is an elegant tea length wedding dress with lots of wow factor. The bodice is gathered with jewel embellishments and has delicate cap sleeves. The skirt flows easily and will pick up movement so that you glide down the aisle. These are just a sample of the Rita Mae short wedding dresses available in our Bexley boutique. 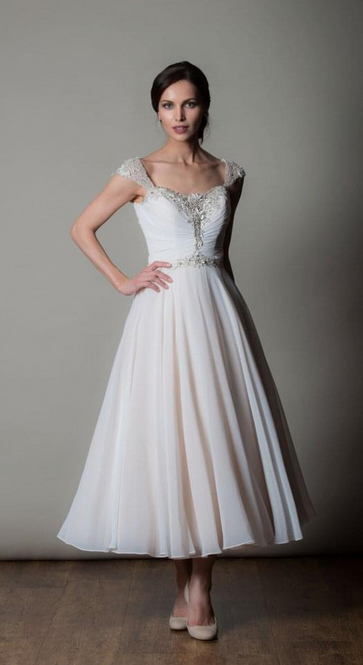 If you would like to try a short statement wedding dress then visit us today. Our highly trained consultants will chat with you to find out your unique style and needs. Then in a relaxed one to one appointment you get a chance to try any dress you would like. We can’t wait to help you find your perfect short wedding dress.